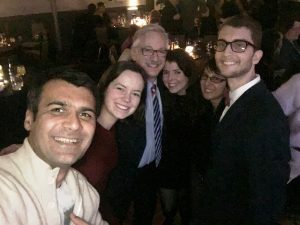 Members of the Bouxsein Lab celebrate with Dr. Mark Gebhardt, Chief of Orthopaedic Surgery at BIDMC, at the 2017 Department of Orthopaedics Holiday Party! Boneheads Crush Fenway Spartan Race! Congratulations to Katelyn Burkhart on her Approved Thesis Proposal!